Russia’s most classified helicopter has been caught on camera over the Kremlin. A pair of Mi-35MS helicopters were spotted taking off from behind the red-brick ancient fortress in downtown Moscow. Russian YouTube user Coocxals reports he spotted two unusually-looking choppers while taking a walk near the Cathedral of Christ the Savior and rushed towards the Kremlin along the bank of the Moskva River, hoping to make a video of the helicopters taking off – and was rewarded for his effort.A couple of special-status olive-painted helicopters, bearing multiple antennas and no tail numbers, soared into the air and shortly disappeared behind the downtown roofs in the Russian capital. “I love helicopters!” Coocxals wrote on YouTube, adding that the video was not edited. Although the special-looking aircraft were filmed on May 7, when preparations for the historic 70th anniversary Victory Day parade on Red Square were in full swing, it gained media attention only half a year later. 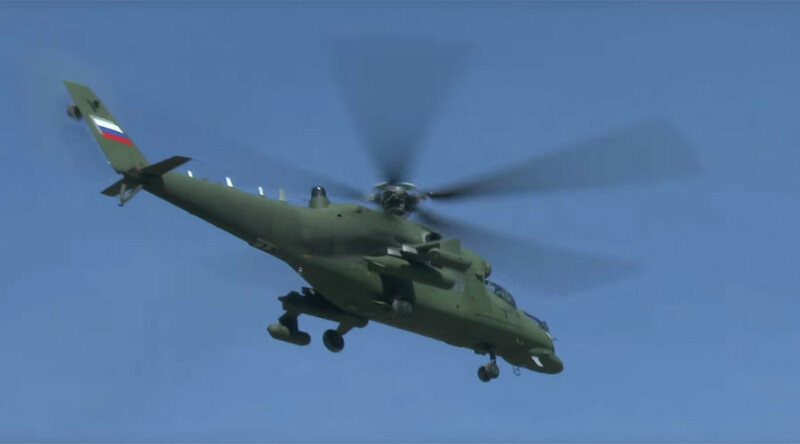 The Mil Mi-35MS is a development from the legendary Mi-24 assault helicopter dubbed ‘Crocodile.’ Yet according to reports cited by Rossiyskaya Gazeta, it boasts improved avionics, modern engines VK-2500, composite blades and all-digital equipment. The aircraft is also reportedly packed full of sensors and radars, such as night flight systems, GLONASS navigation system, Rainbow-N-B satellite station, jam-proof communications equipment, fully computerized pilot cabin and brand-new large panoramic rectangular-shaped illuminators. Just like its battle-ready elder brother, the Mi-35MS bears a couple of short wings, but instead of guided missile launchers, the helicopter bears containers with electronic warfare equipment protecting the aircraft from air-defense missile attacks. The aircraft has non-retractable landing gear which helps to compensate the impact shock in case of a hard touchdown. The Mi-35MS is positioned as special military command and control/communication helicopter for VIP flights, Coocxals pointed out. An operable Mi-35MS was first spotted in 2013 at a military base in the southern city of Rostov-on-Don.